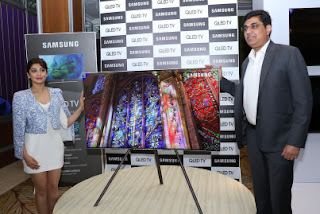 Bangalore, India – May 24, 2017 – Samsung Electronics today unveiled its flagship premium line-up of QLED TVs in Bangalore and showcased its innovative TV, The Frame, redefining the future of home entertainment with cutting-edge TV technology and style. The ‘TV of Light’, a name given to Samsung QLED TV for its delivery of optimal brightness levels and stunning visual experience, is ushering in a new era of televisions and transforming the living room of tomorrow with its focus on the lifestyle TV concept. With this, India’s number one TV brand will further consolidate its leadership in the market. Samsung also showcased its newest innovation – The Frame. Instead of fading to black like a conventional TV, The Frame’s display transforms into a work of art, letting users select from a collection of more than 100 art pieces in 10 different categories, including landscape, architecture, wildlife, action, drawing and more. Paired with numerous options for art layouts and colours, as well as customizable accessory options including interchangeable bezels and an optional Studio Stand, it truly complements the user’s living space. “QLED TV, powered by Samsung’s quantum dot technology, provides true-to-life images that no other TV can match. It empowers you to think about the television in a new way, bringing art and entertainment into new parts of your home. The QLED TV is as beautiful when turned off as it is when it’s on and will help us grow the demand for premium TVs as well as our market share in India even further,” said Mr. Rajeev Bhutani, Vice President, Consumer Electronics Business, Samsung India. QLED TVs have been designed with the consumer in mind and focus on addressing three key consumer pain points through solutions known as Q Picture, Q Style and Q Smart. This year, Samsung introduced new design elements that can fit into any home regardless of the interior aesthetics or setup. The all-new Invisible Connection cable helps manage unsightly cords and clutter with a refined, single cord system. Consumers can now design their space with a single optical cable that brings all devices together, reclaiming the living room space once occupied by set-top boxes and external devices. Samsung is focused on the continued evolution of its much-lauded Smart TV offering, giving people the simple, unified user experience they want for all their entertainment content. With the Samsung One Remote, consumers can control most connected TV devices with just one remote control. The enhanced Samsung One Remote now supports more devices and offers voice control capabilities across more Smart TV features. In addition, Samsung’s latest Smart View App allows users to seamlessly share content from their smartphone to the TV. Users can enjoy a more personalized experience with the new ‘Smart Hub’ interface on the ‘Smart View’ app. The Smart View app supports both Android and iOS mobile devices. INR 3,14,900 and INR 24,99,900 in India.